The four pillars of our Commitment are foundational to your McGill experience. As a student in the Faculty of Agricultural and Environmental Sciences, you will be immersed in a culture grounded in your program’s unique perspectives, approach and curriculum. 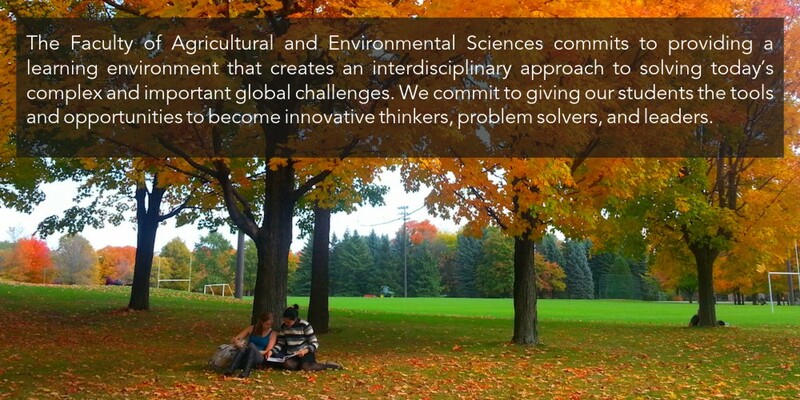 The Faculty of Agricultural and Environmental Sciences (FAES), located on the beautiful Macdonald Campus of McGill, is a close-knit community of world-class researchers, staff, and students who care deeply about the world they live in. All of our academic programs (Environment, Food and Health, Nutrition, Bioresource Engineering, and Agriculture) provide opportunities for students to undertake hands-on learning and research projects, to access local or international internships and exchanges, and to take part in entrepreneurial initiatives. The FAES commits to providing a learning environment that creates an interdisciplinary approach to solving today’s complex and important global challenges. We commit to giving our students the tools and opportunities to become innovative thinkers, problem solvers, and leaders. Our instructors are innovators commited to enhancing the student experience by removing the boundaries between lecture halls and real-world problems. They embrace the concepts of active and experiential learning. Macdonald students “learn by doing,” through courses and laboratories that use both on and off-campus resources to enhance the educational experience. Innovation: Award-winning Food Science students develop tantalizing new food products through the Food Product Development course. Community: Each year during Nutrition month, students in the School of Dietetics and Human Nutrition's Quantity Food Production course delight the campus community by offering a series of Meal Events featuring cuisines from around the world. Communication: First-year Environmental Biology students participating in the award-winning St. Lawrence Ecosystems course undertake on-campus field research projects and communicate with scientists around the world via social media. Creativity: Each year Bioresource Engineering students compete in an undergraduate design project. Projects range in topic from the design of solar heating systems to improved bread quality via machine vision. Enhancing the Student Experience: Many courses take advantage of our campus resources including the Macdonald Campus Farm, Horticulture Research Centre, Morgan Arboretum, the McGill Herbarium, and the Lyman Entomological Museum. The FAES provides opportunities for Macdonald students to participate in field study semesters, field courses, internships, and international student exchanges, both domestically and abroad. Participation in an internship is an excellent way to apply classroom learning to real life, while gaining firsthand work experience. With both local and international options available, students have the opportunity to acquire practical knowledge and refine their career goals as they build employment skills and a strong network. The Bieler Family Internship Office provides all the assistance needed to find the right internship. Together with the Macdonald Campus Career and Placement Services (CAPS), our staff helps students with employment opportunities relevant to their academic program. The FAES participates in all university student exchange programs available at McGill. Macdonald students may choose to round out their programs by taking part in one of our four international field study semesters: Africa Field Study Semester, Barbados Field Study Semester, Barbados Interdisciplinary Tropical Studies, or the Panama Field Semester. Alternately, students can take a field course like Sustainable Agriculture & Food Security in Cuba. The Macdonald Campus is located within one of the largest high-tech hubs in Canada. Student entrepreneurs from the FAES are at the forefront of business development in the agri-food, bioresource engineering, biotech, health, and environmental sectors. The Program harmonizes rigorous academic training with unique co-curricular opportunities and resources to support student entrepreneurs across the Faculty. Academic Minor: The Faculty offers an 18-credit Academic Minor in Agribusiness Entrepreneurship in partnership with McGill’s Desautels Faculty of Management. Students develop the knowledge and skills required to start and grow businesses, social enterprises, and cooperatives in the Faculty’s areas of expertise. Students may complement the minor with an internship. Competitions: Annual entrepreneurship competitions allow students to pitch their business ideas to investors at local, regional and international entrepreneurship events to seek start-up funding. Competitions include: the Macdonald Entrepreneurship and Innovation Competition, McGill’s premier Dobson Cup Entrepreneurship Competition, and the Hult Prize Competition. Workshops and Seminars: Entrepreneurs and business leaders are involved with the program through seminars, guest lectures, and our mentorship program. We bring together leaders from both academia and business, including everyone from investors to policy entrepreneurs, to help students to gain enriched knowledge, a sense of social responsibility, and full confidence in their abilities to solve problems. Student Experience Enhancement Fund: As of Fall 2014, full-time students of the Faculty are eligible to apply individually or as a group for funding to support experiential non-academic learning initiatives. Examples of opportunities which may be eligible for funding include: Non-Credit Internships, Independent Research, International Volunteering or Internships, and Academic Conferences where students are making significant presentations. Active engagement in the research process brings immense benefits to an academic program. Students have the opportunity to participate in Honour’s programs, special projects and design courses integrated into their curricula, and in competitive summer research programs. Students develop transferable skills that are useful both in academic and professional spheres, while applying their theoretical knowledge beyond the classroom. Undergraduate students are encouraged to participate in research with a supervising professor in a variety of fields, including animal science, parasitology, food science, dietetics, wildlife biology, plant science and bioresource engineering. Awards are made available through NSERC Undergraduate Student Research Awards, with donors offsetting possible associated costs. Of course, research is not only for undergraduates! Our graduate programs (M.Sc., Ph.D.) are research-based. Macdonald Campus professors are world-renowned researchers, working on projects as wide ranging as plant genetics and food security in Canada's North, to sustainable agriculture and biotechnology. Graduate students work both in the lab and field and receive advanced training to help solve the planet's most pressing challenges. Students are encouraged to develop leadership skills through participation in student-led initiatives and clubs at the undergraduate and graduate level, in on-campus projects and events, or by volunteering for community organizations on both university campuses. Help is here if you need it: The Macdonald Campus is a strong community, and we care deeply about everyone’s wellbeing. There are many services on campus to help students realize their full-potential, including counselling and financial aid through Student Services, program support through the Student Affairs Office (undergrad) or Macdonald Office of Graduate and Postdoctoral Studies (grad). The Mac Peer Helper Program is a confidential listening and referral service staffed by trained student volunteers. Fitness is important, too: Students will find a variety of recreational and varsity sports offered at Mac through McGill Macdonald Athletics.